First founded in 2007 at the U of T St. George campus, Fly with Origami, Learn to Dream (FOLD) started out as a small group of origami artists who wanted to share designs in the company of those who also enjoyed their art. Since then, FOLD has established a foothold within the University of Toronto’s diverse co-curricular background. 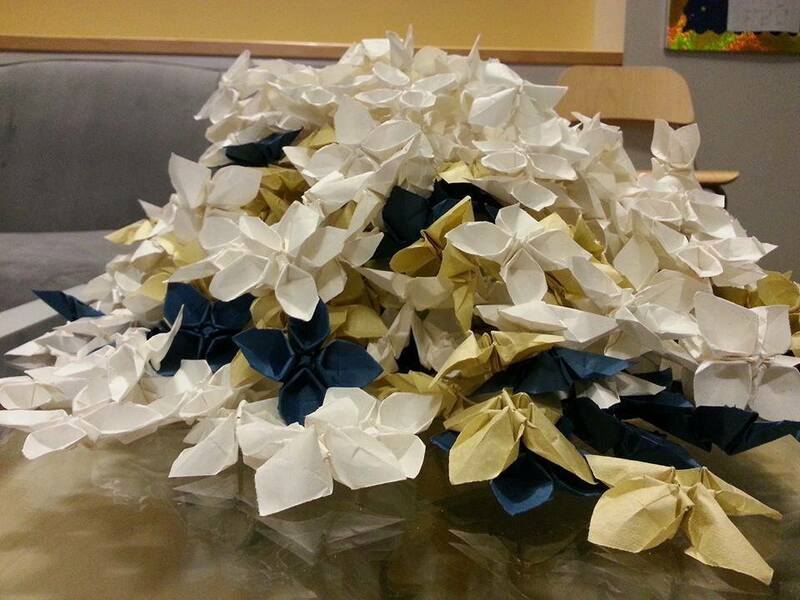 This summer, FOLD is embarking on a public health initiative to promote awareness of cancer and origami paper folding by breaking the Guinness World Record for the largest display of origami flowers. The daffodil, the logo of the Canadian Cancer Society (CCS), is a hallmark for cancer survivors, and has become the biggest symbol for cancer support in Canada. With this in mind, FOLD has decided to concentrate its efforts around this symbolic flower, and has created an origami daffodil design for its world record attempt. 51,900 origami flowers, all made from yellow paper, will be used in a mosaic to recreate the Canadian Cancer Society’s daffodil logo. The mosaic is scheduled to be exhibited at the St. George campus during the fall, and will be a full-day exhibition that is open to the public. FOLD will also be kicking off a widespread fundraising campaign this fall to raise $10,000 with all proceeds going to the CCS. Today, the prevalence of cancer constitutes a global health concern, affecting millions of people worldwide. Some types of cancer have become well-known in the news, such as breast cancer or skin cancer. Standalone organizations, such as the Livestrong foundation, have also been established for single types of cancer. On the other hand, sufferers of comparatively rarer cancers find themselves with less research and less support, often fading into obscurity. They receive less recognition despite facing the same difficult challenges as other cancer victims, and it is FOLD’s aim to change this. The group’s installation intends to promote awareness of all types of cancers, and to provide support to all those who need it. By creating the world’s largest display of origami flower daffodils, we hope to draw attention to the Canadian Cancer Society’s mission and values in a unique and refreshing way. In addition, the group wishes that the final display of flowers will bring warmth, beauty, and art to the community, acting as a symbol of hope for those affected by cancer. And finally, the monetary donations yielded from our members, executive staff, and other donors will all go towards the Canadian Cancer Society in order to further the battle against cancer. Every flower folded is a small step towards opening a meaningful discourse for those who have cancer. It is an encouraging, inspiring message to ensure that no cancer patient walks alone. And finally, it is a symbol of art, beauty, and the limitless support that any cancer patient should deserve. In future, FOLD hopes to continue collaborations with the CCS to continue supporting cancer awareness and research.